In the past months, I am shocked by the progress of artificial intelligence (mostly implemented by deep learning). In March 2016, AlphaGo won Lee Sedol (李世石) in Weiqi (go). I had mixed feelings, excited, sad, and some fear. Around new year of 2017, AlphaGo won 60 games in a row against numerous top professional Weiqi players in China, Korea and Japan, including #1 Ke Jie. There is no doubt AlphaGo is at least a level better than top human player. It’s interesting to see that the way how people call AlphaGo has changed from “dog” to “Teacher Ah”, reflecting the change of our attitude toward artificial intelligence. convert text to handwriting: Try yourself at http://www.cs.toronto.edu/~graves/handwriting.html Maybe in the future you can use AI to write your greeting cards. In the field of biology and medicine, deep learning also progresses rapidly. 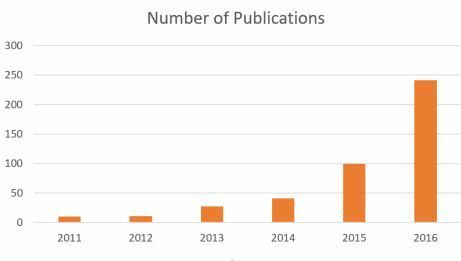 Below is the number of publications using keyword “deep learning” in PubMed. “Deep Learning” is also a keyword in my Stork. I got new papers almost every day.